Spinnaker Yachts provide high quality Corporate Entertainment, Team Building and Race Charter Sailing events based either in Poole, Dorset, or in the Solent. We think Poole Harbour is the perfect sailing location for Corporate Hospitality Events because of its sheltered waters and beautiful scenery. It is also the largest natural harbour in Europe, and is renowned as a playground of the rich and famous. The golden beaches of Sandbanks and Studland Bay are on our doorstep and the spectacular Jurassic Coast is just around the corner. 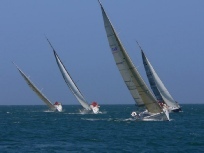 Various types of Sailing Day are available; any of which can be tailored to suit your particular requirements. Contact Neil on 07976 303 792 or Jim on 07805 927 288 to discuss your own particular requirements and to arrange your perfect day. Spinnaker Yachts was set up by Poole Pilots Jim Macgregor and Neil Vardy in 1997. 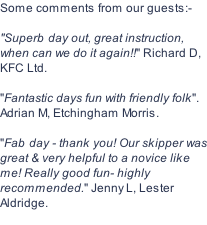 Since then we have provided our loyal clients with an exciting range of sailing events, both in Poole and in the Solent. We now have a fleet of the latest Elan 410 yachts, and provide top quality Corporate Sailing Events and Team Building Exercises. 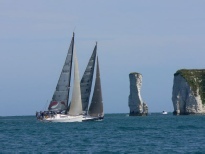 We also enjoy racing with our clients at the highest level in events such as Cowes Week, The Little Britain Challenge, Cork Week, The Round the Island Race, and various other industry regattas. Our catering for the 2015 season will be provided by Toby and Leslie at The Deli on the Quay in Poole. They specialise in innovative and delicious contemporary British food using only the best quality local produce. We can cater for almost any occasion, from a light lunch to a full three course meal served on board our yachts.